Apart from never being far from the coast in Japan, the country also has an abundance of rivers which transform into popular playgrounds during the summer months. A slightly landlocked city like Tokyo has more than a few rivers running through it. Two of the largest are the Tamagawa and the Arakawa rivers. These rivers begin in the mountains beyond Tokyo and flow through the heart of the city into Tokyo bay. 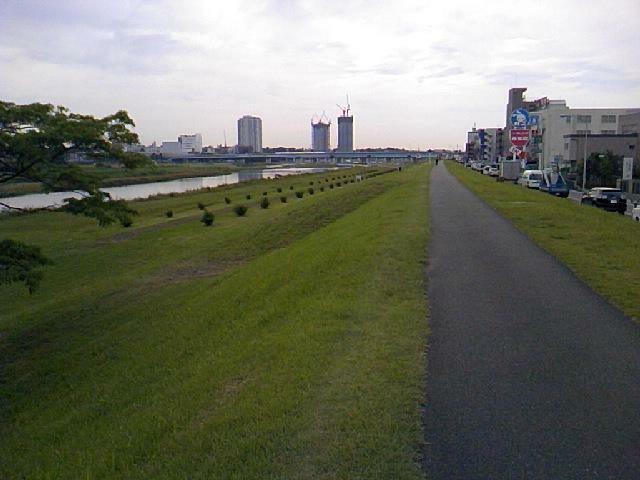 At first glance, riverside landscapes in Tokyo may seem somewhat overly “urbanized” to foreign visitors. It’s fairly common to have sections of rivers in Japan concreted to protect from flooding and Tokyo is no exception. Don’t let first appearances put you off however. During summer, the riverside is the place to go. 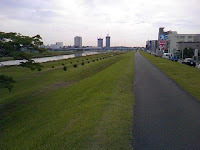 Sports grounds are very common along the riverside. On weekends these grounds are packed with little leaguers and corporate sports teams. Aside from sports there are plenty of open spaces for picnics, fishing, kite-flying and even dog runs for your canine friends. Barbecuing however is forbidden in Tokyo parks and riverside recreation areas. Neighboring prefectures such as Kanagawa do allow barbecues though. On the Tama River for example you only have to walk across to the Kanagawa side where there`s a real party atmosphere to light fires and barbecue to your heart’s content. Whether you’re on the Tokyo side or the neighboring prefecture’s side of the river, summertime down by the river in Tokyo is quite the experience. Music festivals, huge group barbecues, kite and lantern festivals are just a few activities you’ll see along Tokyo’s riverbanks in the summer. Of course the beach is great too, but if you can’t get to the seaside, the river offers a great time also. If you come to Japan at this time of year the first thing you'll probably notice is the heat, or more importantly, the humidity. June is a rainy season in Japan. The Rainy season is not only wet, but also extremely humid. The season typically ends in mid-July but sometimes lasts a full two months. Visitors from neighboring Asian countries can probably take rainy season and it's stickiness in its stride, but those from more temperate zones often find it a steep adjustment. One thing you can do during this season is spend as much time in air conditioned zones as possible. A lot of locals do this. Using the air conditioner in your accommodation can be expensive. Many people make use of the air conditioning in shops, restaurants and coffee shops. Coffee shops are particularly good as unlike in many countries; coffee shops in Japan usually don't have staff hounding you to keep buying drinks. You'll see a lot of people in summer hanging out in places like Starbucks doing some work or study. If you're here on business during this season, wearing business attire can be uncomfortable to say the least. Fortunately though Japan has invented the business fashion code known as "cool biz." Cool biz was an initiative that aims to curb power consumption during the hot summer months by allowing workers to wear lighter and cooler designs and no neck-tie. If you're doing business here during this season, you may be fortunate enough to work with colleagues that permit this style. Of course there's always the traditional visit to the beach or pool to cool you down. Rainy season may not be the best time to go outdoors but occasionally the sun pops out. Apart from being muggy and wet at this time there is a positive side to the rainy season. If you don't mind the weather, it's usually a cheaper time to get air tickets to Japan. Every cloud has a silver lining. Even if they are black rainy season clouds. Tokyo is known for being a concrete jungle but unknown to many visitors is that there is a real jungle of sorts within the city limits. 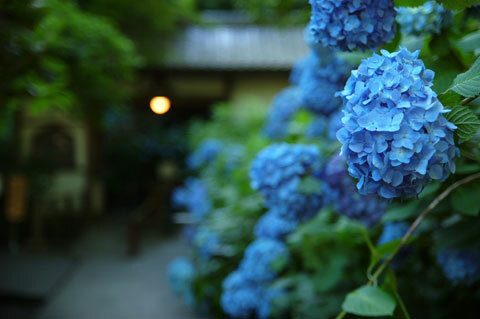 Located just 6 kilometers from Shibuya in a cozy residential area of Tokyo lies Todoroki canyon. Todoroki is well-known among Tokyo dwellers as a desirable neighborhood. The suburb is home to several smaller foreign embassies and wealthy company directors but still has a relaxed, quaint atmosphere. One possible reason for its popularity could also be its natural canyon. Todoroki canyon follows a stream that flows into the Tamagawa river for approximately one kilometer. It is conveniently located only minutes from Todoroki station. Once inside the canyon you would have no idea that you are in a suburban area let alone a suburb in Tokyo. Locals jokingly refer to it as the "Todoroki jungle." Lush vegetation and tall trees block the majority of sunlight into the canyon making it an ideal respite from Tokyo's intense summertime temperatures. Following the stream trail will take you about fifteen minutes. Along the way you can buy souvenirs, stop for soba noodles or pray at the shrine. One or two restaurants are situated above the canyon and provide fantastic views. Getting there is easy. From Shibuya you can take the Tokyu Toyoko line and transfer to the Tokyu Oimachi line at Jiyugaoka, or the Tokyu Den-En Toshi line to Futako Tamagawa where you can transfer to the Tokyu Oimachi line. Todoroki station lies between Jiyugaoka and Futako Tamagawa stations. 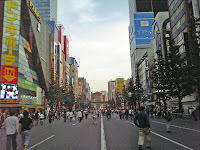 Anyone living in Japan already, or is thinking of coming over has no doubt heard of Akihabara. Electronics buffs, anime fans and gamers the world over are all familiar with Tokyo's electronic district. But you don't have to be a computer nerd or comic book fan to enjoy Akihabara.So famous is Akihabara that it is a major tourist destination for visitors to Tokyo. Whether you're looking for a new camera, or figurines of your favourite anime characters, Akihabara will provide you with an eye-opening experience.Akihabara is also home to Japan's "Otaku" culture. Otaku loosely translates to what we might call in English a geek or nerd. Otaku flock to Akihabara as it's a treasure trove of collectibles, manga and anime goods. Along the main street, and the back streets as well, there are dozens of shops selling collector's cards, figurines or classic toys. Some stores are huge and are multi-storied. Another popular variety of store with otaku are "maid cafes." These are cafes where the (all female) staff dress in maid outfits. Many of these maids can be seen on the streets of Akihabara advertising their particular cafe. Even if maid cafes aren't your thing, it's certainly entertaining seeing the maids on the street trying to entice walkers by.Apart from costumed maids it's very common to see aspiring young pop idols along the streets of Akihabara. Many perform shows on the streets hoping to gain enough attention and get snapped up by a talent scout. Again, this is a very interesting experience if it's your first time to Akihabara.Then there's the electronics. If you're after electrical goods, then you couldn't be anywhere better. There are several big chain vendors present in Akihabara, but there are also many small shops selling excellent quality second hand goods. Many stores offer duty free shopping and English speaking staff. Remember to shop around though as there are many stores to choose from and competition is tight.So even if you're not an anime fan or electronics enthusiast, there are a lot of interesting things to see and do in Akihabara. 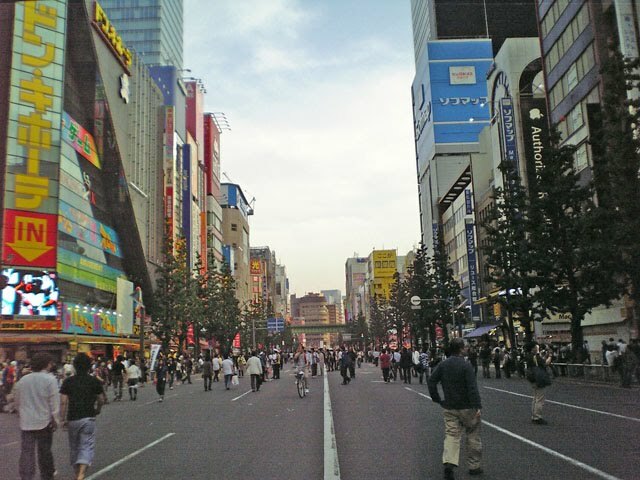 The town has developed from an electronics district to a must-visit place for tourists to Tokyo. If you are visiting Japan, one place I will definitely recommend is the Trick Art Museum. At the Museum, you can experience the excitement of trick art ("damashie" in Japanese), which creates the illusion that depicted objects really exist and make the two-dimensional paintings look as if they are three dimensional. You can position yourself in the right place and take a photo as if you are within the painting. 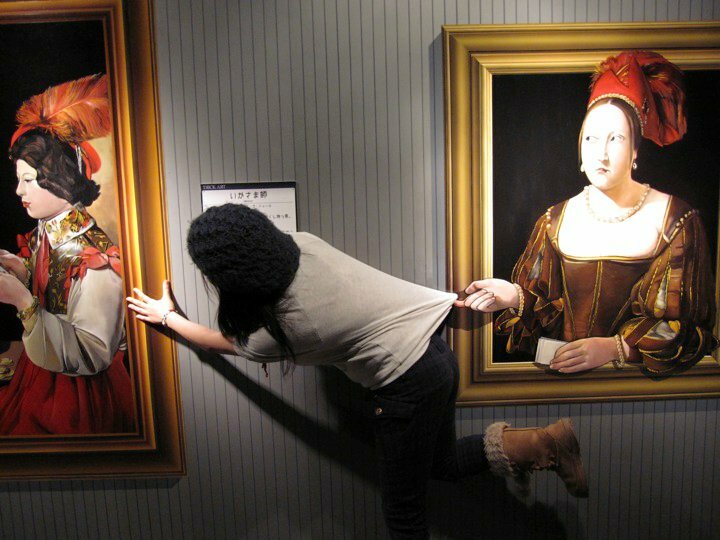 For example, doesn't the photo above look as if the woman in the painting is pulling the girl's shirt? At the Trick Art Museum, there are numerous trick art paintings, which include swimming with dolphins, falling from a cliff, getting eaten by a dragon, and coming out of a manhole. The paintings vary depending on which museum you go to. You can take pictures either alone or with someone else; just make sure you don't forget your camera! The trick is to take pictures a couple of times for each painting and later select which of them looks more realistic. You can find Trick Art Museums all around Japan. The well-known place is the Takao Trick Art Museum located near Mount Takao west of Tokyo. If you have the chance, you should definitely go because you will definitely have an enjoyable and memorable time! Just bring along a playful spirit! 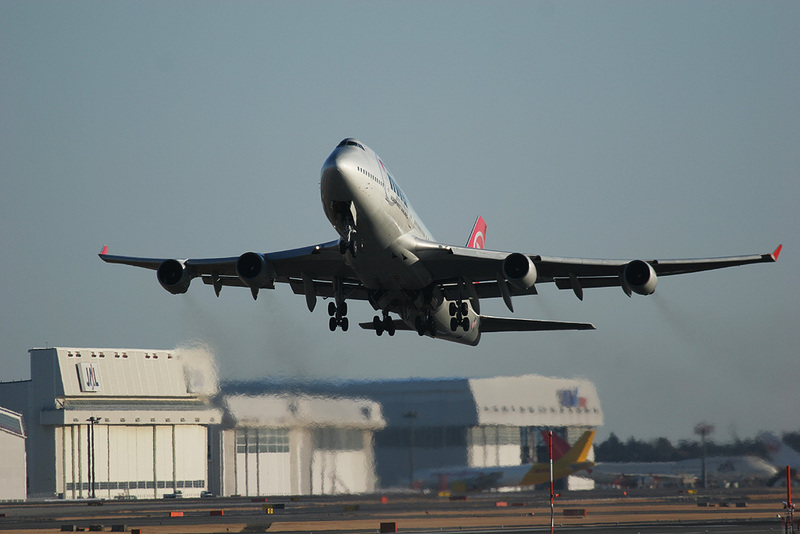 Like many other major cities around the world, Tokyo's main international airport is not within the city's limits. In Tokyo's case, it's not even in Tokyo. In case you didn't know, Narita International Airport is located in, well, Narita which is in Chiba Prefecture. It`s some 60 odd kilometres from downtown Tokyo. This makes getting to and from the airport a little more difficult for the first time traveller to Japan. Not to worry though. Japan's famously efficient public transportation will save the day. Upon arrival at Narita you will find the "Airport Limousine Bus" ticket counters just across from the arrivals gate. This bus service is great if you are staying at one of the major hotels in Tokyo. Buses also go to popular transit hubs such as Shinjuku, Shinagawa, Shibuya and Tokyo stations. You can even take the limousine bus to outlying suburban areas as well as Yokohama. Depending on where you are going, the journey into the city is usually around 3000 yen (one way). Being a bus means they are at the mercy of traffic conditions. If the roads are relatively clear, expect a travel time of one hour to reach the inner city. Make your way downstairs from the arrivals gate and you're on your way to the train stations. Both terminals at Narita are serviced by two railway companies. JR (Japan Railways) and the Keisei Railway Company. Directions to both are clearly marked. The Keisei Skyliner Express train is cheaper (1900 yen one way) than the JR Narita Express (2500 yen one way), but the JR Narita Express has the advantage of stopping at Tokyo, Shinagawa, Shinjuku, Shibuya and Yokohama stations. The Keisei line only goes as far as Ueno in Tokyo`s north east. Both trains only stop once or twice between the airport and the city. Travel time is approximately 80-90 mins depending on where you are travelling to. More adventurous and thrifty souls may like to try taking the local commuter trains on these lines. Word of warning though. You will have to transfer a few times. This can be quite disorienting for a first time visitor. To sum it all up, there are three main options you have to reach Narita airport. The limousine bus isn't the cheapest or fastest option but it is convenient. You won't need to negotiate busy train stations with all your luggage either. JR and Keisei express trains guarantee you a fast and easy way to and from Narita but are only available at certain stations. Local trains are the cheapest way to Narita but can be very confusing, not to mention slow. If you don't mind splashing out, you could take a taxi which will set you back a few hundred dollars US, or you could take the helicopter service between Narita and Roppongi for a mere US$600 one way. In any case, here's a particularly useful video explaining how to get to the city upon arrival at Narita airport. 24-Hour Television "Love Saves the Heart"
If you are in Japan around the end of August, you might see people wearing yellow shirts holding donation boxes. They are volunteers for the annual 24 Hour Television-Love Saves the Earth charity drive sponsored by Nippon Television Network Corporation and its affiliates. The telethon began in 1978 as a charity project aiming to introduce existing conditions of social welfare in Japan and around the world and to address the need of assistance to disadvantaged people. The telethon has been very successful raising a total donation of 27,248,414,171 yen as of September 2008. The donation is used not only for people in Japan but also for people around the world. During the event, various special programs are aired, which one of the main events includes a full marathon participated by a famous Japanese TV personality. Last year, a 42km relay swim across the Tsugaru Strait and an eight-hour ping pong rally in attempt to break the world record were aired. Fundraising drives are also conducted at numerous stores around the country during the week. This year will be the 33rd annual telethon (August 28th and 29th) with TOKIO, a popular Japanese pop band, as the main personality. For every event there is a specific theme and the theme for this year is "ARIGATOU~Ima Ano Hito ni Tsutaetai~" -"Thank you~ Now I would like to say thank you to this person~". Watching the program 24 hours nonstop may be difficult, but if you have the time, take a glance at it since it is definitely worth watching!